Want to send your special needs child to summer camp? There are lots of options - explore them here! We are asking parents to let us know of any camps they know of or have attended. Info: The Niagara Region Chapter Summer Camp is a program that welcomes all individuals with autism spectrum disorder and provides the ultimate camp experience. We believe Summer Camp should be a safe place where campers can be properly supported as they create, explore, and achieve the unthinkable. This camp is run for six consecutive weeks over the July and August summer months, running in three locations across the Niagara Region; St. Catharines, Niagara Falls, and Welland (with two weeks in each location). Supporting the integration of campers with special needs is one of our core philosophies. The Director and Sunshine Coordinator will meet with the parents to review each camper's specific needs. We will then create and implement a program and support system for your child. This ensures a successful integration and a rewarding camp experience for all of our campers and staff. If, as in some instances, the support required exceeds our standard level of supervision, there will be an additional fee for any extra support provided. Bayview Glen Day Camp has proudly aligned with Jacob's Ladder. Each year Jacob's Ladder climbs higher and hopes to get closer to finding cures for neurodegenerative illnesses. Jacob has been attending Bayview Glen Day Camp as a camper for five years now. While having the time of his life, little did he know that he was changing the lives of others as well. Please visit www.jacobsladder.ca for more information. Price: Camp Awakening is a registered charity and receives no government funding. We operate on a shared-cost basis meaning the published fees are already subsidized by our generous community of donors and are just 50% of the "true cost" of camp. Camper fees vary per session and fees have not been raised in 4 years. Fees include: accommodation, meals, staff supervision, activities & programming, accessible transportation between Toronto-Camp, and at-camp Tuck Shop. The Executive Director will speak with you privately and confidentially about financial assistance. Info: Founded in 1982, Camp Awakening is a registered charity offering summer camp programs that give youth with physical disabilities the opportunity to increase independence, make lasting friendships, develop confidence and accomplish things they never thought possible. Camp Awakening partners with established summer camps offering a wide range of activities and a dedicated accessible cabin. Our summer camp and leadership programs create opportunities for youth with physical disabilities to make friends with other campers just like them and accomplish things that they never thought they could before. Building on over 30 years of experience, Camp Awakening counsellors are great role models and mentors who are skilled at adapting activities to meet each campers’ desire for adventure. As a registered charity, Camp Awakening does not receive any government funding. We rely on the generosity of individuals, foundations, corporations and community groups to provide the funds necessary to make camp happen each summer. Info: Our Rock-hounders Program; designed for younger campers (around age 8-13) will include activities to develop, encourage social skills, and will boost confidence. There are tons of activities to choose from and you don’t need to be an expert! This is an opportunity for the camper to try something new, or become skilled in an area they love. Making friends and keeping them is our goal! Our Summit Program; designed for camper’s aged 13+. Our highly trained staff will help build their social skills while gaining critical job and independence skills in a fun, friendly and safe environment. This program will encompass many areas of daily living with active learning opportunities such as making trips into town to do laundry, or purchase food and ingredients for meals. These campers will also take part in activities that contribute to harmonious camp life like cabin duties, maintenance around camp, harvesting vegetable garden, learning work ethics and over coming challenges of working in groups. Campers will create a “home” of their own at camp and will walk away confident with new skills, a foundation for future employment and being more self sufficient. Info: Camp Dawn is a registered charity which operates a 4 day camping retreat for adult survivors of an acquired brain injury. Camp is held each September at Rainbow Lake in Waterford Ontario (Camp Trillium). Info: Camp Discovery was founded in 2004 and has since been a leading overnight camp for children and youth living with type 1 diabetes. After almost a decade at its original site, Camp Discovery moved to Easter Seals Camp Woodeden on the western outskirts of London, Ont. Camp Discovery is for children and youth between the ages of 7 and 16. To complement its Overnight Camp, Camp Discovery also offers a Leadership Development Program. Camp Discovery is held at Easter Seals Camp Woodeden in London, Ontario and overlooks the Thames River. Address: 1252 South Waseosa Lake Rd. Info: Camp Huronda was founded in 1964. For seven years, Camp Huronda rented space at Camp Beausoleil and Camp Couchiching before finding a permanent home on Lake Waseosa in 1971, at the previous site of Camp Waseosa. Camp Huronda is the only camp facility owned by the Canadian Diabetes Association and the only camp that runs a full summer program. Info: At Camp Kennebec, campers aged 6+ with Autism, ADHD, learning & social difficulties & other special needs have a great time, accomplish more than they ever expected, make new friends & create fabulous summer memories they deserve. Every day is a perfect blend of individual choice & 50+ waterfront, land, creative and artistic activities including horseback riding & water-skiing. Info: With plenty of staff support and a non-competitive program, the Camp Kirk experience is tailored to building resiliency and boosting confidence. Our warm environment allows our campers to truly enjoy the summer - as every kid should! Special accommodations for children with Learning Disabilities, AD/HD, High Functioning Autism and Incontinence/Bedwetting. Unique experience for kids 6 to 13 with exceptionalities: LD/AD(H)D, ASD and/or Incontinence (bedwetting) issues. Established in 1993. Staff/camper ratio of 32/36, Camp Kirk provides a nurturing, non-competitive environment allowing children opportunities to achieve success and raise their self-esteem. Give your child the magic of empowerment through the Camp Kirk experience. Info: Integrated, non-competitive camp for children and teens with and without LD, ADHD and high-functioning ASD. SOCIAL SKILLS PROGRAM, ACADEMIC PROGRAM, and 50+ SPORTS and ACTIVITIES. Staff includes many educators, social workers, child & youth workers. 2-to-1 ratio. Doctor and 3 RNs on site. Lakefront cabins with electricity, full bathroom & shower. 425 acres & 4 km of lakefront. All camp activities are planned with a view to teaching skills, building confidence and improving self-esteem. We achieve this by carefully structuring all of our activities to ensure success. Teaching is done by skilled instructors who break tasks down into manageable chunks and present them in a logical sequence. In this way we can be sure that our campers will be successful. We acknowledge every accomplishment, and never miss the opportunity to provide positive feedback and recognition. Info: Since 1963, Camp Marydale offers boys and girls a fun-filled summer experience. Each camper will learn new skills, make new friends and develop an appreciation of nature as a creation of God. Our goal is to provide our campers with fun, new experiences! Marydale Park is found minutes from the heart of Hamilton and runs adjacent to the Binbrook Conservation area.The C.Y.O. has made it our mission to break down barriers, fully integrating all children despite their financial situation, religious or ethnic background, or ability. Info: Camp Misquah provides camping opportunities for children and adults with developmental disabilities. Our programs are within 1 hour from Ottawa. Clients enjoy many activities including swimming, hiking, arts and crafts and campfires. The best way to meet our guest’s special needs is to provide professional, caring staff members. For that reason, the camper-staff ratio is kept at 2:1. Staff are chosen for their experience, skills, and maturity. Many staff members are bilingual and in addition are instructed in basic sign language, first aid, behaviour management as well as search and rescue. The waterfront staff are NLS certified. Address: 98 Mink Lake Rd. Info: Our camp is open to all boys and girls aged 8-16 years of age who are ready for the physical and social dynamics of a ten-day residential camping program. We hold high expectations with regards to the level of respect and courtesy extended amongst campers, and balance these expectations with a high level of support provided by positive role models. Our trained staff team will model, consistently, the very characteristics we purport to teach our campers. We will make special concerted efforts to ensure that all children and families, regardless of financial situation, feel welcome and included at Camp Smitty. We will create a registration process that is barrier-free, and will actively attempt to provide information that is supportive to the cultural and socio-economic diversity we strive to serve. Self-Concept: Enhancing self-esteem, feeling good/positive about oneself, discovering talents/interests, being included in decision-making. Social Skills: Developing interpersonal competence, group living, getting along with others, gaining appreciation for diversity. Character: Building positive values, mutual respect, taking responsibility for self, learning skills, unique outdoor experiences. Fun: Good old-fashioned healthy fun, room to breathe, getting 'unplugged', chance to be a kid. - Applicant must have a current psychological assessment that indicates the presence of a learning disability and average or above-average cognitive reasoning skills (IQ). - Children and adolescents who experience social, emotional, mental health & behavioural problems. - Children and adolescents who can manage an intensive residential program. Please note that 2 or 3 weeks in an intensive residential camp environment is not for everyone. Not every type and level of behaviour difficulties can be managed in the camp environment, and constant one-one supervision is not available. Suitability for the camp program will be reviewed on a case by case basis and the final decision rests with the Camp Towhee Director in consultation with the Clinical Team at Integra. Info: CNIB's Lake Joseph Centre (commonly known as "Lake Joe") is a fully accessible lakefront facility located in the Muskoka region, providing a unique blend of recreation and vision rehabilitation in a safe, inclusive environment where guide dogs are welcome. Two hours north of Toronto, Lake Joe stretches over 12.5 acres of waterfront property on the northwest corner of beautiful Lake Joseph. There, a wide range of programs are available to people of all ages who are living with vision loss. Info: At Easter Seals Camp Merrywood, campers expand their leadership abilities through a myriad of creative arts programs and multi-sports activities. During the summer, the camp offers three 10-day Individual Camp sessions, one 5-day Discovery Camp session for children 6 – 12 years, one 7-day Sports Camp for campers 13-18 years, one five-day Family Camp session; three GEAR-UP and Leaders in Training sessions, and one 7-day Out-tripping Adventure trip to Algonquin Park. Info: This is a 5-day residential summer camp experience for children with Autism. The focus of the week is on social and therapeutic recreation supported by a high ratio of staff to campers. Groups of five campers experience the social skills inherent in a camp setting with four staff to support individual needs. Info: Nova’s Ark runs Summer Camps during July and August. The Camps offer opportunities for individuals with varied abilities to join our trained volunteers and college education placement students to explore the many interesting therapy animals and participate in indoor and outdoor activities . The focus continues to be on social and communication skills through exploration and sensory stimulation. Individuals will be encouraged to participate, with their Circle of Friends, in a number of structured interactive activities which are modified to meet the needs of each participant. · Daily activities including archery, rock climbing, trail walks, bonfires, fishing, arts and crafts, various water sport activities and lots more. · Transportation is not included. Info: Say hello to Summer! Camping is for everyone, and Variety Village offers a variety of programs to ensure we meet the needs and interests of your camper. Summer Day Camp offers new experiences, skill building, a sense of community and lasting friendships — extended hours is available to support your families busy schedule! For over 65 years our goal has been to improve the quality of life of all people, regardless of their abilities. By offering specialized programs and services, we create a level playing field without barriers, intimidation or other obstacles. Info: Our camps are devoted to assisting children to care for, and ride horses in a safe, fun and interactive environment. This is a great opportunity, to learn to feed, ride, and care for a horse in a safe, fun and enjoyable environment. Info: Come swim, explore, and develop lasting friendships! Campers experience an authentic day camp experience, with the care they need to thrive. · Hands-on learning and skill building, but it feels like fun! Info: We welcome campers with special needs each session. For these children, camp is fun, growthful and safe, a place where they are fully included in the community and celebrated for who they are. For other campers, these children bring special gifts: By their presence they teach and remind us to respect every human and to know and cherish people who are different from ourselves. We have been welcoming our special campers for 20 years; they are important to us. Our campers with special needs live in fully integrated regular camper cabins, with an extra counsellor in the cabin to ensure that their particular needs are met. We are able to accommodate campers with autism, developmental delays and Down’s Syndrome. Because of the rough terrain of our site, we cannot accommodate children with significant mobility limitations, and because camp requires group living, we also cannot accommodate children with behavioural issues. We can accommodate children with special needs for flexible session dates. Info: Willowgrove Day Camp has a long and rich history of providing a quality camp experience for campers with special needs between the ages of 3 1/2 and 13. Special Needs fee: (in addition to regular camp fees)is $125/week. To request a tour or learn more about our Special Needs program, please contact our office to speak directly to Miriam Reesor, our Camp Director. Address: 942 Clearwater Lake Rd. Info: There are two leaders in a chalet with 3-4 ‘typically developing’ campers and one camper with an exceptionality. Both chalet leaders are equipped to meet the needs of the camper, modifying programming according to the campers’ physical, intellectual, social or behavioural needs and integrating them into the chalet. Campers with exceptionalities have 1:1 support throughout the day. This can be adjusted according to the camper’s independence and ability. Each camper is valued as an important part of the camp community, so we tailor the camping experience to fit the needs of each child. For instance, a child with autism having sensory issues might need to be introduced into the noisy dining hall by incremental steps. Our staff find ways to make the camping experience positive and inclusive for everyone. Info: For over 30 year Camp Shalom has been a leader in summer camp programs for adults who have special needs. We have built many relationships with group homes and caregivers who rely on our camp every year to offer respite for caregivers and parents along with fun and meaningful vacations for their clients. Many of our guests have attended for over a decade and look forward to it every year. Our staff participate in two weeks of staff training before the guest come to learn how to handle the unique needs of our guests. We also provide a healthcare team to manage medications and any other healthcare needs that may arise. With over 30 years of experience you can feel secure that your son, daughter or client will have a fun and safe experience at Camp Shalom. Info: Kettleby Valley offers an integrated day camp program for children with special needs. These Campers benefit from having a One to One Counsellor. Our program is available for children on the Autism Spectrum, with Down Syndrome, A.D.D, A.D.H.D. and other special needs. We offer the added assistance and support of having the full attention of a counsellor while enjoying the same traditional activities normally offered at camp. Everyone has unique triggers and our counsellors are there to help their campers work through these triggers in a positive way. Although there are considerations made regarding each individual camper, our expectations of our One to One campers are the same as any other child at Kettleby Valley. We believe that holding campers with exceptionalities to the same standard is critical for them to learn how to cope with situations that they face in everyday life. Our integrated program is very popular and the resources we have are limited, so please contact the camp for availability prior to registering. An additional fee of $55 per week above the regular day camp fee applies. A meeting at the camp with our One to One Director prior to the summer is mandatory for campers and families who are new to our camp and it is strongly recommended for returning campers and families. We believe that everyone should be included in every aspect of day camp life. This means that campers with special needs are given the same opportunities at Kettleby Valley Summer Camp. It also means that they are held to the same expectations when it comes to behavior. We cannot be selectively inclusive. If parents choose our special needs camp program, they should know and understand that we will encourage the child to participate in activities, behave according to our code of behavior, and be part of a group. Info: Heartfit Fram Holidays is a program for adults 18+ with developmental differences. Info: Camp Winston provides inspiring recreational opportunities for kids with complex neurological disorders who need highly specialized support. Located on beautiful Sparrow Lake in the Muskoka region of Ontario, we operate a summer camp, weekend retreats and week-long retreats throughout the year. Camp Winston’s primary focus is to set our children up for success. We operate four, two-week summer sessions attended by about 145 campers aged 7 – 13 years from across Canada. Campers may then continue in the Camp Winston community in our Teen Program for ages 14 – 17. In most cases, this is the first time in their lives they feel welcome and secure enough to participate without being rejected or alienated by their peers. Campers are encouraged and supported as they participate; often for the first time – in various recreational activities including various sports, swimming, tubing, kayak and canoeing, crafts, theatre, ropes courses, nature studies and canoe trips. While having fun, they learn vital social and gross motor skills specific to their needs. Our Camp offers a unique opportunity for these children to participate in specialized programs with mature, professional, well trained staff. Our counsellors and activity instructors are older and more experienced, and we have a high ratio of counsellors to campers which allow on-to-one support. Ages: graduated from Junior or Senior Kindergarten. Info: Brightstart Camp offers educational programming with support for kids with autism and other language delays. This summer camp program is geared towards children who will be entering into or have currently graduated from Junior or Senior Kindergarten. Address: 3048 Barrie Hill Rd. whether it is fun activities at our camp location or travelling to a big destination like the Toronto Zoo or a water park. Our campers enjoy all aspects of camp programming including lots of active pursuits. Being out in the community is a big part of our program plus providing unique sensory and developmental experiences complete a great camp programming day. All participants are supported by their own counsellor who facilitates some great social and recreational experiences that are age appropriate. Attending water parks and rock climbing gyms, swimming and going bowling, these are just some activities that our participants get to enjoy plus making friends and enjoying lots of social time. Each counsellor is specially trained and highly capable and look forward to spending the summer with your young adult. Focused on volunteer experiences, transit training and social and life skill building, this program is geared to those youth who can function with a 1:2 Mentor to participant ratio. All of our participants experience some hands-on volunteer work at local businesses to help them practice and prepare for an employment opportunity on their own. Coupled with some great social and life skill activities like budgeting, cooking classes and sharing with their peers, this program helps to develop independence and professionalism for our participants. Building on the learning that has happened through the Summer Youth Program, we can continue the volunteer experiences, resume building and interviewing skills that this population needs assistance with. Fun is also achieved through outings to restaurants, movies and GTA based attractions, while working on our social and life skills. Great relationships are formed with the mentors and fellow participants which continue throughout the year at monthly “hang-outs”. Info: All of our programs (listed below) are completely accessible and made available to all participants. Belwood Lodge and Camp works with a unique modification policy to adapt our programming to the needs of everyone who attends our camp. Participation is encouraged and is the key to fostering friendships and memories! All of our programs (listed below) are completely accessible and made available to all participants. Belwood Lodge and Camp works with a unique modification policy to adapt our programming to the needs of everyone who attends our camp. Participation is encouraged and is the key to fostering friendships and memories! Info: Beautiful forests, rolling fields and lots of lakeside waterfront are waiting for you only 1.5 hours from Toronto. Camp Couchiching focuses on individual development and challenge by choice. Info: Robin Hood was the first day camp to fully integrate children with special needs; an unheard of concept back in our early years. It came from a natural desire to care for every child and it has been truly gratifying to see staff and campers of all abilities embrace each other’s differences. Camp is a powerful social experience for everyone. Under the direction of Camp Owner/Director Sari Grossinger, we are proud to be recognized internationally as leaders in the field of inclusion. As a paediatric Occupational Therapist, Sari and her team of professionals, work with families throughout the year to ensure a successful summer for all. This includes special training for our staff, providing adaptive equipment where needed, and planning modified programs. Throughout the summer, a Camper Relations Representative provides a consistent point of contact for families requiring extra attention. Before enrolling in this program, Sari and the Camper Relations Team will often conduct home and/or school visits to assess if our camp is the right fit for their child. Camp Robin Hood is not a traditional therapeutic environment therefore the assessment process includes important discussions between camp, family, teachers and other professionals as necessary. Our goal is always to provide a positive camp experience for all of our campers. We recognize that we cannot meet every child’s needs but do our best to work towards a safe and successful summer for all involved. * Some additional fees are associated with this program. Camp Erin Toronto is a weekend-long overnight bereavement camp in Muskoka for children and teens in the Greater Toronto area. The camp finds grieving children through various community agencies—most notably the Dr. Jay Children's Grief Centre—and combines traditional outdoor camp activities, such as swimming and canoeing with grief education and emotional support activities, such as journal making and a candlelight memorial ceremony. Camp Erin activities focus on providing campers with the tools needed to help them in their grief and with difficult experiences throughout their lives. It also enhances self-esteem and provides pure enjoyment. The Camp gives children and teens the opportunity to meet with other grieving kids in a fun and natural environment; understanding that they are not the only ones to experience the death of someone close to them decreases the sense of isolation that many grieving children experience. All activities are facilitated by our grief counsellors and trained volunteers. Info: Children at Risk will again be offering an all Day Summer Camp for children diagnosed within the Autism Spectrum Disorders (ASD) for the Summer of 2018. Graciously, The King’s Daughters & Sons (Ottawa City Union) have agreed to continue as our Major Funder – and along with a donation from the Unity for Autism Foundation, HOPE Volleyball SummerFest, City of Ottawa Community Projects Funding, fundraising and other private donors, plans are again for 5 weeks of Camp this summer! Info: March Break, Summer Camp or Winter Camp all have one thing in common. It is a place where youth can come to make new friends, participate in the arts and enjoy both indoor and outdoor activities. Also great for families who are looking for a day program to transition their child into. Schedules are adjusted to include seasonal themes and guests are included to create a fun, and interactive time together. We encourage everyone to participate in the variety of activities that revolve around the arts primarily drama, dance, visual arts and music. Outings and field trips are scheduled accordingly to support our weekly agenda. It is a time to participate, socialize, make new friends, interact with community partners who also come and visit along with volunteers and staff. Info: Join us in the summer for our 8-week evening class sessions! Please e-mail us at contact@danceabilitymovement.com to register or find your Host Studio’s page under the REGIONS tab for specific registration details! The Dance Ability Movement offers half-day camps at our Milton & Mississauga locations. See below for descriptions on camp styles for the 2017 summer. Check the Host Studio page’s for details on dates and costs. – Dancing Through Life (Teen-Young Adult): This half-day camp is dedicated to teens and young adults who love to move and are looking to develop skills in relationship-building, healthy living, and self-confidence through the shared experience of dance. Dancers will create and organize a showcase including their own choreography to perform at the end of the week. – Set the Stage (Pre-school and School Age): This morning camp is dedicated to pre-school and school age children preparing for school in the fall. Children will have opportunities to develop both Fine & Gross Motor Skills through the use of dance and the Handwriting Without Tears Program. Occupational Therapists will provide direct support to enhance your child’s pre-printing and/or printing abilities. A great way to practice school skills over the summer in a fun and motivating environment! – Art Expressions (Kids – Teens ages 7+): This afternoon camp provides an opportunity to participate in and learn various art forms as a means of self-expression. This camp is ABILITIES focused, and classes are structured to provide the just-right level of challenge for each individual participant. Participants will be exposed to various dance forms, musical rhythms, and visual arts activities. Emphasis is placed on developing ways to self-express through the arts, building confidence, learning new skills, making new friends, and most of all having FUN! Info: Fiddlehead Care Farm offers year round programs and services targeted at improving our members' physical, spiritual, psychosocial and mental health so they can reach their potentials and become their best self. Our summer camp is an integrated and accessible farming, science and nature day camp for children ages 6 and up. This low ratio, supportive camp for kids with unique physical and psychosocial needs is run by experienced therapists on organic farmland in Mono, ON. Fiddlehead Care Farm's mission is to give children, youth and young adults with varying abilities the opportunity to learn, experience and grow without boundaries. Info: We provide leadership courses in many different areas but one program that we are particularly proud of is our Secondary Growing Leadership course. This is focused on students in Grades 9 – 12 from across the province who, in general terms, access special learning supports/services. There are more criteria (listed on our website) to assist with identifying suitable participants. This course runs from May 7 – May 11 and all of our staff are top teachers who are released from their duties to facilitate this program. Most are qualified with their Special Ed certifications and all are deeply committed to maximizing the potential of these often underserved and more ‘non-traditional’ leaders. The students develop a belief in their own abilities, self-advocacy, communication and collaborative skills. We hear wonderfully rewarding stories of their personal growth on their return to schools. There is more information on our website (www.oelccaso.com). Here is the direct link to this Secondary Growing Leadership course. You will see that there is a cost for this course. We are a not-for-profit so we try to keep it as affordable as possible. We also offer bursary aid to lessen the financial barriers within our own capacities. Programs: Grade 6 Leadership for Innovation and Creativity was formerly called Leadership for the Intellectually Curious Learner. It is offered to Grade 6 students who may be described as just that - intellectually curious and is geared for those who thrive when given opportunities to be innovative and creative as they explore relevant and exciting issues in their world. The course is designed to engage students in a journey of self-discovery and acceptance as they develop the leadership skills necessary to effectively combine their ‘gift(s) with their passions’ to make positive contributions to the world. This course is also appropriate for those students who are identified as gifted. Students will be involved in leadership development sessions and social justice workshops as well as a range of optional outdoor recreational activities. Please note (new this year!). Teachers are welcome to come to this course with a group of students from their school. Perhaps consider bringing a contingent of Grade 6 students who would benefit from developing leadership competencies that they can take back to their schools. Info: WHAT IS CAMP OOCH? Year-round at our various sites: Overnight Camp in Muskoka, at The Hospital for Sick Children (SickKids), three other paediatric hospitals, various healthcare centres in Ontario and at Ooch Downtown, our urban recreational facility in the heart of Toronto. Kids with and affected by childhood cancer, their siblings and their families. Some campers are newly diagnosed and on active treatment and some have been in remission for years. In general, the ability to understand social interactions, read facial expressions, perceive and express emotions, and interpret language’s more subtle meanings is acquired intuitively at an early age. Those with learning disabilities, however, sometimes need help in both developing and understanding these social skills. As they learn, they also need a safe and supportive place where they can practice these skills. LDATD’s Social Skills Programming provides opportunities for developing important and positive peer relationships. Topics will include: non-verbal communication, problem solving, active listening, giving and receiving compliments, self-esteem, dealing with bullying, establishing and maintaining friendships. While continuing to practice their social skills, campers will also get to participate in games, arts and crafts, and recreational activities. Address: 2311 Oxford St W.
Info: Overlooking the Thames River on the outskirts of London, Easter Seals Camp Woodeden is situated on 107 acres of beautifully landscaped ground that includes an accessible tree house, a collection of trees/plants from around the world, and beautiful Japanese influenced architecture. Originally known as “Woodholm,” Easter Seals acquired the property in 1946 to create a camp in southwestern Ontario for Easter Seals kids. Woodeden currently has 18 buildings, including seven camper cabins, as well as an outdoor amphitheatre, outdoor swimming pool, high ropes course (North America’s only fully accessible one), accessible indoor climbing wall, outdoor pavilion and a fully accessible tree house. In 2011, a new gym, climbing wall and life skills kitchen was open. The camp offers programs such as swimming, arts and crafts, pottery, music, drama, life skills and sports such as sledge hockey, archery, wheelchair basketball, lacrosse, badminton, a nature trail with Yurts for overnight sleep-outs and a fully accessible high ropes challenge course. At Easter Seals Camp Woodeden, campers expand their leadership abilities through a myriad of creative arts programs and multi-sports activities. During the summer, the camp offers two 10-day individual camp sessions, two 10-day Leaders-in-Training sessions, one six-day and two ten-day Gear-up programs, one 5-day Sports Camp, a 5 day Discovery Camp and one five day Family Camp. The camp is run by a staff of 68, which includes a team of 4 registered nurses and 2 health care assistants. 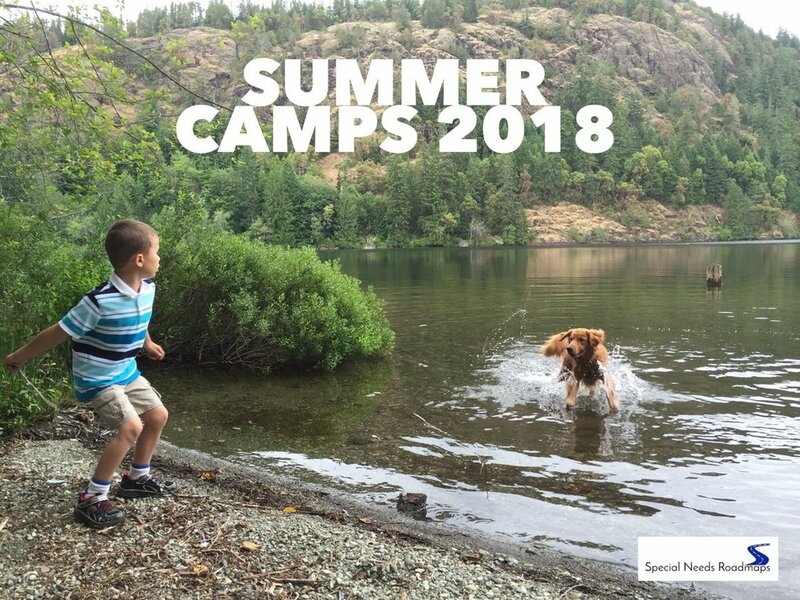 Info: Camp Wimodausis is a specialized SNAP day camp for children ages 6 to 11 whose social and behaviour problems would otherwise prevent them from attending a summer day camp. Two summer sessions in July and August are offered on a first-come, first-served basis. Children may attend one four-week session, with a maximum of 24 children enrolled in each session. Info: The Christian Horizons Family Retreat is a unique opportunity for families living with disability to enjoy a vacation together in a safe, fun and rejuvenating atmosphere. Our faith-based retreat is open to all families and incorporates optional activities for spiritual and personal growth as well as fun and relaxation. These activities may include water sports, good food and fellowship, daily special events such as petting zoos or carnival, Bible reflections and encouragement, and a parents ' dinner out. Each family is assigned at least one trained volunteer who will help facilitate participation in the day's activities as desired, ensuring that your family is able to experience everything the retreat has to offer. We believe everyone is created in the image of God and has gifts and abilities to share. This camp is a place where those gifts are celebrated... a place to belong. Info: PROGRAMS WILL FOCUS ON SCIENCE EXPERIMENTS, COOPERATIVE GAMES AND ZONES OF REGULATIONS. · Focus on working in small groups to share ideas and be creative. · Participants will enjoy the hands on activities but most of all predicting the outcomes and the awesome cause & effect of the experiments. · Good sportsmanship – have fun! · ZONES of Regulations will be incorporated throughout the week focusing on exploring a variety of tools to rate their emotions and reactions to challenging social scenarios. · Each program provides plenty of opportunities for the peers to mingle, socialize and to have time to get to know one another. Info: The Sunshine Day Camp is a popular LDAO-C program for children aged 7 to 12 that focuses on development of social skills. It is offered every summer to children who have a learning disability and/or ADHD. Located in a safe and secure environment, our campers can expect an atmosphere that is positive, supportive, social and fun. The camp provides training in social skills while also offering fun, non-competitive activities like arts and crafts, sports, music, and special presenters. Our excellent, trained staff reinforces targeted social skills and helps each child to build self esteem. All camp activities use positive techniques based on collaborative problem solving.